THE reader is here presented for the first time with an English version of the Minor Historical Productions of the Venerable Bede. In his larger and more important work, “The Ecclesiastical History of the English Nation,” the Author has taken a general view of English History during his own time. In the minor pieces, contained in the present volume, he has contracted his range to a narrower compass, introducing us, as it were, within the walls of those most interesting societies, the Monasteries of the Saxon period. 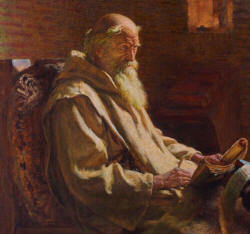 In the “Lives of St. Cuthbert, and of the Abbots of Weremouth and Jarrow,” the simplicity of the narrative, the almost daily account of the occupations of the Monks, and the minute details of the introduction of many of the useful arts into England, form altogether an attraction, which we shall seek for in vain in any other writer, who has left us any memorials of the ways of life, which existed among our Anglo-Saxon progenitors. “The Life of St. Vedast” was written by Alcuin, though published on the Continent among a Series of Biographies under the name of Bede. It was originally intended to have formed part of the Appendix to the present volume; but the arrangement of the various pieces having been confided to a friend, during the translator’s absence on the Continent, it was placed immediately after “The Life of St. Felix.” It remains, therefore, only for the reader to enjoy this very interesting narrative, but by no means to look upon it as a genuine production of the Venerable Bede. “The Life of St. Felix” was transferred from the metrical legend of Paulinus, Bishop of Nola, by Bede, into a prose narrative; and the compiler is therefore not responsible for the miraculous facts recorded, his office having been merely that of a faithful translator. “The Letter to Abbot Albinus” relates to our Author’s Ecclesiastical History, whilst the important “Epistle to Bishop Egbert” has left us a deplorable picture of the demoralized state of Monachism in the eighth century. It will be read with much interest at the present moment, having always been considered a most important document on Church Discipline,—a subject which in our day has at length rivetted the attention of all thinking and zealous members of the Anglican Church. “The Account of the Seven Wonders of the World,” and “The Book of the Holy Places,” were compiled by Bede, for the use of his own Monastery. The latter is chiefly taken from the crude and ill-digested narrative of Adamnan, who wrote from the dictation of Bishop Arculph. “That Holy Prelate,” says Bede, “from a desire to see the Holy Places, left his native country and went to the Land of Promise, where he stopped two months at Jerusalem, having an old priest named Peter, for his guide and interpreter. He then with great zeal visited every thing around, which he longed to see, and travelled to Alexandria, Damascus, Constantinople, and Sicily. On his way home, the vessel in which he sailed, after much beating about, was carried by contrary winds to our island; and here, after various perils, he came to Adamnan, and narrated to him his voyage, and what he had seen.” We are thus furnished with a well-authenticated account of the Holy City and the rest of Palestine, prior to the Crusades, by an eye-witness, and one who surmounted every difficulty to achieve the object of his pilgrimage. “The Chronicle of the Six Ages of the World,” in the last section, affords many interesting particulars of English History. As a system of Chronology, it is important; and drew forth, no doubt, in the eighth century as much attention as those of Usher, Newton, and Hales, did in the respective periods of their promulgation. “The Narrative of the Translation of the Body of St. Cuthbert” from Lindisfarne to Durham, extends from the year 875 to the Episcopate of William, Bishop of Durham, who succeeded Walcher in 1080. Of its anonymous author nothing is known; and the text adopted in the translation is that revised by Mr. Stevenson, and published by the English Historical Society in 1841. A General Index to the entire volume has been added by the publisher; who is also responsible for the few notes, both marginal and otherwise, interspersed through the following pages, the absence of the translator on the Continent, during the progress of the work through the press, having been caused by a severe domestic affliction.